Vader vs. The Funny White Stuff | What Do You Want? We had a little bit of snow overnight, not really more than a dusting of the landscape. But for Vader, our cocker spaniel, it was something really exiting. He sniffed the whole lawn and even ate some of the funny white stuff. Finally he started running around like a bat out of hell and greatly enjoyed being chased by Silke and me. 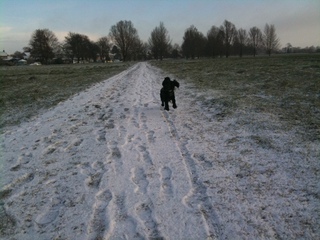 He is a picture of Vader enjoying himself on the snow covered Stourbridge Common earlier today.